Our weekly meetings return to Tuesdays starting May 21st and continue through our Thanksgiving Football Luncheon in November. Exceptions: if there is a Monday holiday the week we meet, our meeting will shift to Wednesday that week. This year, Columbus Day is the only day will impact our meeting in this way. Watch your email and the club calendar for info on these types of changes! 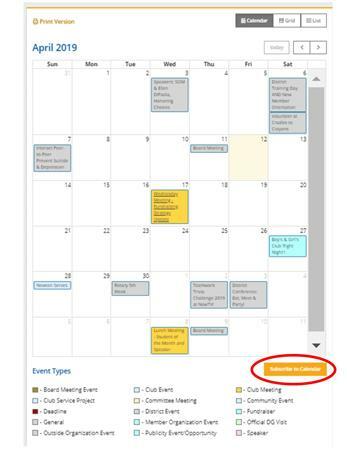 Also, be sure to SUBSCRIBE to the club calendar so all club meetings & events (and details!) will automatically show up on YOUR calendar. Wouldn't that be nice? To subscribe, go to the Calendar on the home page and scroll to the bottom. You'll see a SUBSCRIBE button there - click on it and follow the instructions.